Two pampered cats, Iggy and Tony, have that look that says they are well-loved and living the good life. But you decide for yourself. Below is Iggy, basking in the warmth of the sun by a window. He can barely open an eye to see what is happening around him. Please see FAQ with regards to having your pet painted by me. “Pampered Cat: Iggy”. Golden and Liquitex acrylics on 8x8 gallery-wrapped canvas. No need for framing. Sides are painted yellow to match the front. Why buy original art work? Painting your furry friend gives me such pleasure. 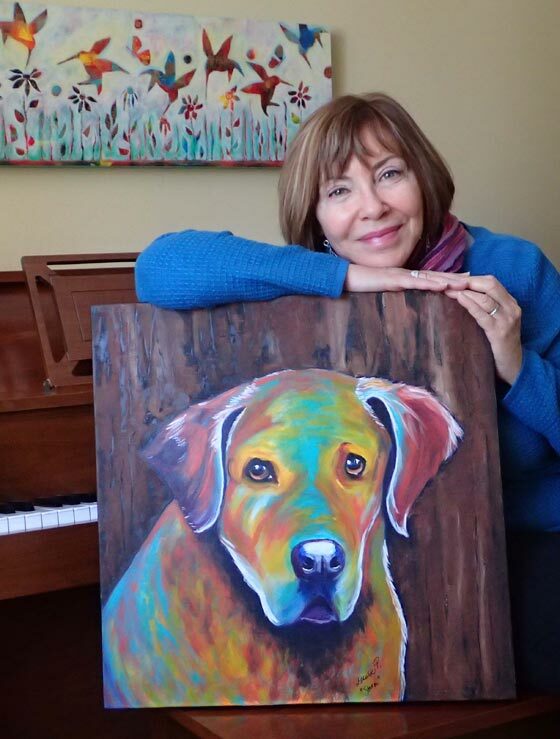 I really get excited when I can see the gleam in the animal’s eye and your pet starts to come alive on my canvas. But I am also very touched when the client is overjoyed at the sight of the portrait. And although I don't want to make you cry, it has happened that a client has cried at seeing her beloved pooch painted on canvas. It brings me joy to know that you are pleased with the portrait I have painted for you. When you display original art handmade by an artist, you are making a distinct statement about yourself to all who visit your home. You are telling everyone what your interests, your passion might be. Truly, with any artwork you have on display, you are adding elements to your own personal story. You are saying, “This is who I am, and this is what matters to me”. How do you paint the animal’s character on canvas? How long does it take you to paint one cat/dog? First and foremost, I must understand the client's expectations. I will want to know the size of the canvas for the portrait, where it will be placed in the home, the colours that might be preferred. My client must also tell me whether or not it is a full body painting or only a section of the body. I will ask what is expected in the background, which props if any the client might want to include such as favourite toys, etc. Certainly, the photos I am sent will help me understand the client's wishes. In some paintings, I use collage. In others I might have a uniform coloured background. I might paint the animal in realistic colours or I might decide the animal calls for an unusual whimsical treatment. For example, Tony, the American Bulldog was painted in blues and oranges. Coco was painted in pastels. The possibilities are endless. I had many photos of these “Pampered Cats” so I selected the photos with the best lighting along with the cutest poses. I encourage clients to send me 4-6 photos of their pet. You do not need to be a professional photographer, but note that the photos you provide must be clear with good lighting. Iggy and Tony’s photos were emailed to me, but I have worked from printed photographs as well. I especially look for the colours and the gleam of light in the eyes and the variations in the fur. With these two pampered cats, I used purple, but I have also used teal for Miss Daisy’s portrait, and many colours in the portrait of Tony, the American Bulldog. In all those assignments, I was allowed the freedom to paint the portrait in any manner I chose. So to get the best character portrayal, I need a good discussion about expectations and a series of photos, some close ups, some with typical poses of your little friend so that I get a sense of your pet’s personality. “Pampered Cat: Tony”. Golden and Liquitex acrylics on 8x8 gallery-wrapped canvas. No need for framing. Sides are painted yellow to match the front. Time frame for pet portrait commissions. I am also asked how long it will take to complete the portrait. The answer really depends on the number of paintings I have on the go when the order is placed. I try to be careful not to accept too many orders at once, so generally, a smaller painting, such as the 8x8 size, would take around three weeks from start to finish. The more detailed the background and the objects in the portrait, the longer it will take to finish the painting. Finally, the client is always eager to have the portrait in hand, but depending on the time of year, and the number of orders to be filled, the wait might be longer than three weeks. Fall is definitely a busier season for commission work since people want their portraits for Christmas gift giving. If the client needs a rush order for some special occasion, I might be able to accept the commission for completion in a shorter time frame. Why buy art from a known artist rather than from a furniture store? Unique pieces of art are genuine conversation starters. Three of my watercolour birds are displayed in a friend's home, but she also has oil paintings of a deceased Husky named Kanouk, painted by her aunt. These are the works of art that draw attention when guests arrive in her kitchen, family room, or living room. They tell everyone that animals are truly welcome in this home, and that she absolutely loves them all. I am so very grateful for all of my clients to date. Many have purchased pets on cards, bags, pillow covers, and coffee mugs. November and December of last year were particularly busy with orders for custom painted pet portraits on wood slices. Being an artist has its ups and downs (a subject for another blog post). When people love the work that I do, and have confidence in my creativity, then life as an artist sure is sweet. It is even better when these clients become good friends and stay in touch. This is truly the best gift of all for any artist. PS. Contact me here if you have any questions and I will gladly reply via email.